When I give Open Source talks on the software we build, I always take a few minutes to talk about risk. Adopting any software technology brings about levels of risk that need to be assessed. Some aspects of risk are obvious; such as "is the product fit for purpose". This can normally be assessed via demonstrations, prototyping and fit gap analysis. Other aspects of risk are not so easy, "is this product healthy". Long time between releases with new features, or no releases at all. End up maintaining the whole project yourself inhouse. Is the project financially profitable already. If publishers are willing to invest in books, you know there is a large end user community. That means lower risk of bugs, and easier to hire people and find consultancies. Commitment to public global speaking engagements, such as java user groups or workshops. We're planning a new webinar on the latest features of jBPM 5 and a preview of some of the upcoming features this week. Register now ! jBPM 5 has taken these unique characteristics to the next level by adopting the popular BPMN 2 standard. BPMN 2 is not only the choice of standard for modeling, but also the choice for native execution. You will also learn how to build adaptive business processes by leveraging the combined power of business rules, business events, and processes. Prakash Aradhya is responsible for driving the product strategy and roadmap for JBoss Enterprise BRMS and BPM products. He has over 15 years of experience in product development and product management in the middleware software industry. Prior to his focus on the BRMS and BPM products, Prakash was responsible for JBoss Developer Platform product management which included JBoss Developer Studio. Prior to joining Red Hat, Prakash worked at Sun Microsystems (now part of Oracle) as SOA Product Manager for the Sun Java CAPS product. Kris Verlaenen leads the jBPM 5 effort and is also one of the core developers of the Drools project, to which he started contributing in 2006. After finishing his PhD in Computer Science in 2008, he joined JBoss full-time and became the Drools Flow lead. He has a keen interest in the healthcare domain, one of the areas that have already shown to have a great need for a unified process, rule and event processing framework. Uploading a XLS decision table results in the creation of numerous new assets, including (obviously) web-guided Decision Tables, functions, declarative types and modifications to package globals and imports etc (Queries are not converted, although supported in the XLS form, as Guvnor doesn't support them yet). This is the first stage of "round-tripping" decision tables. 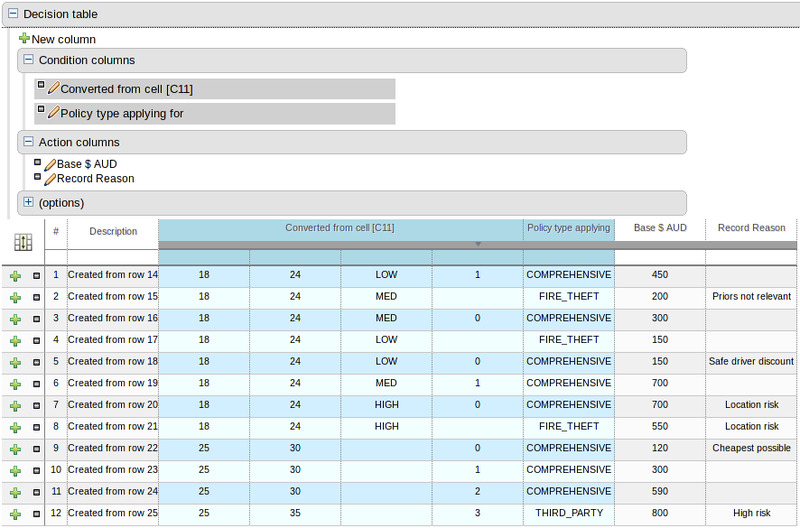 We still need to add the ability to export a guided decision table back to XLS, plus we'd like to add tighter integration of updated XLS assets to their original converted cousins - so if a new version of the XLS decision table is uploaded the related assets' versions are updated (rather than creating new) upon conversion. 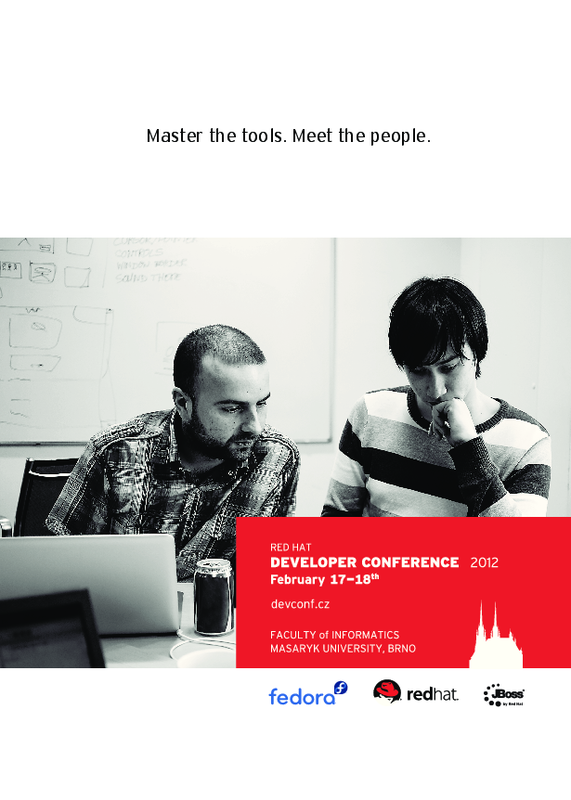 Next week, on Friday 17 February, I 'll be presenting a introduction to Drools, Guvnor and Planner at the DeveloperConference 2012 in Brno, Czech Republic. There are plenty of other interesting JBoss talks, about topics such as CDI, Arquillian Drone, Errai, Infinispan, Hibernate OGM, ... The entrance is free, so join us if you're in the neighborhood. Alexandre Porcelli has joined the Drools&jBPM team today. Alexandre is an Antlr guru and also leads the Open Spotlight project, http://porcelli.github.com/OpenSpotLight/. Alexendre will initially be helping out on the Guvnor work for jBPM, then in a few months time we hope that he'll lead our work around distributed computing. Alexendre lives in sunny Brazil, you can read more about him here,http://porcelli.com.br/. Wumpus world continues to improve and is now fully playable. The UI has a lot more polish now and nearly all of the code has been moved to DRL now, including the swing graphics rendering for the cave and the sensor panels. You'll need to use master head to try it. 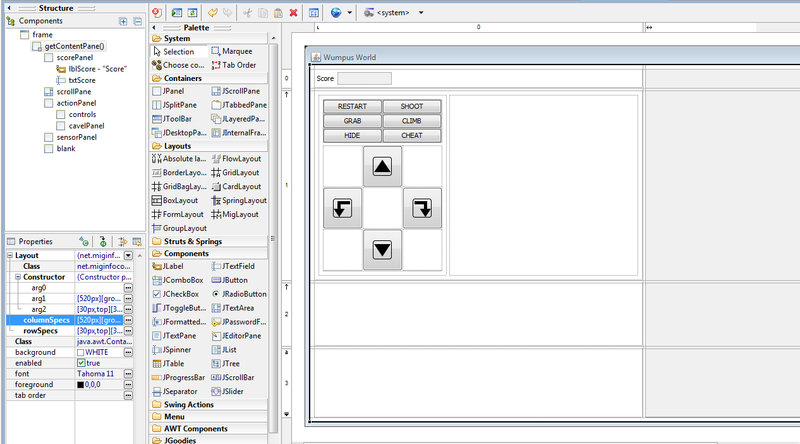 Java is just used to build the kbase from the drl files and to create the swing panels, buttons and forms. 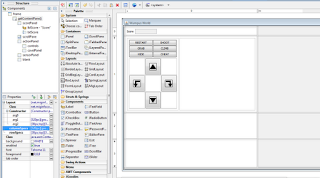 WindowBuilder was used to graphical layout things. The final thing I have to do is allow for client integration, so that people can write rules to automate the hero. Cave is hidden, playing the game purely with Sensors. 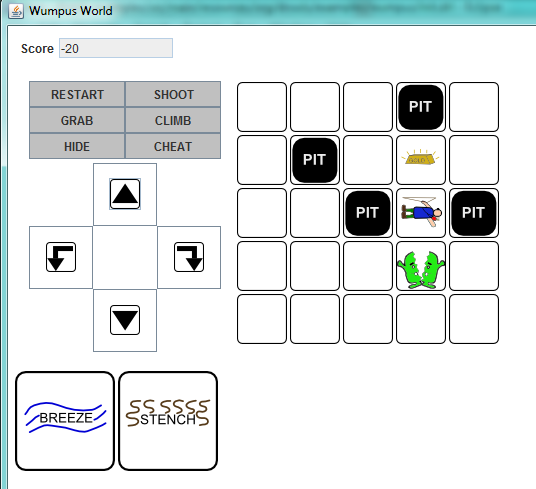 Cave is now shown, but unvisited rooms are greyed out. 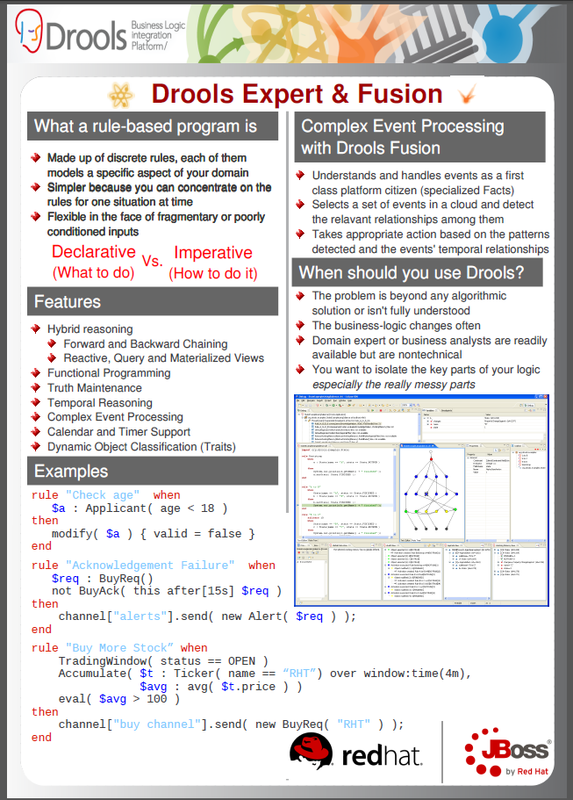 A few weeks ago Packt Publishing released the Drools Developer's Cookbook, written by Lucas Amador. I had the opportunity to review an early draft of the book last year and when I received my copy of the released book I was eager to read it and check out how was it. I am glad to say I am pleasantly surprised. Packt is known for publishing many high quality books on open source projects and it has already published 2 other books on Drools, but managed to publish this 3rd book with a completely different perspective and as so, allows readers to choose which ones they would benefit more from. While JBoss Drools Business Rules, by Paul Browne, focus its content on higher level rule authoring and an earlier version of Guvnor, Drools JBoss Rules 5.0 Developer's Guide, by Michal Bali, is a deeper tutorial-style reading that builds on the examples from chapter to chapter, detailing how every piece of the puzzle fits together. 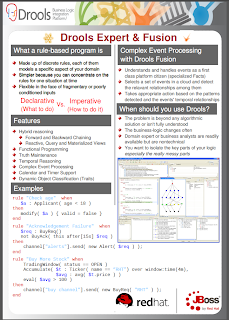 Drools Developer's Cookbook on the other hand, as the name implies, contains recipes on how to leverage Drools' features to effectively build business solutions. This is an excellent format for those with some knowledge of the platform and that want a detailed reference on how to use specific features. While the Developer's Guide is more suited for a throughout reading, the cookbook is a good reference material that can be read on a chapter basis in any order the reader wishes. "Getting ready" details which setup steps are necessary to use the feature/complete the task in that recipe, like for instance, additional jar dependencies or configuration options are required. 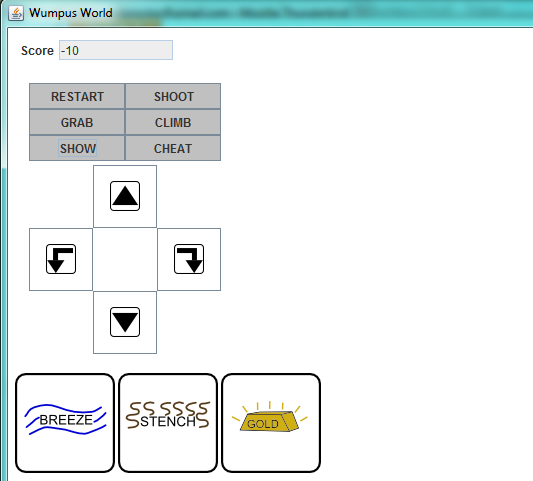 "How to do it..." is a step by step explanation of how to use the feature/complete the task. "How it works..." is my favorite section and explains how and why things work the way they do. This is important knowledge that can be leveraged to achieve different goals. Some recipes also have references for additional documentation or information. The book covers an extensive set of components and features, as can be seen in the table of contents: from the core Drools Expert, to Guvnor, Fusion, Planner, Camel/Spring/JPA integration and even a bit of jBPM. I think the book will be really helpful to a large percentage of the Drools user base. Unfortunately, the book is not perfect. There are some minor issues, like some typos in some of the printed examples. The good news is that this is totally offset by the great support Packt provides to all their published books. The (fixed) source code is available for download, and I imagine the errata should be soon available as well. The over 40 recipes in this book are an excellent resource, and I am sure it will left the readers looking forward for more! 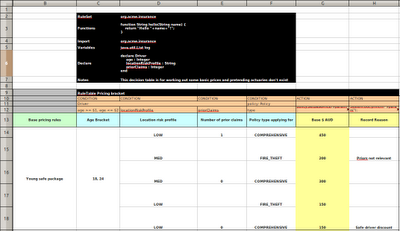 Implementing TSP or vehicle routing in Drools Planner 5.4.0.Beta2 and earlier was difficult. 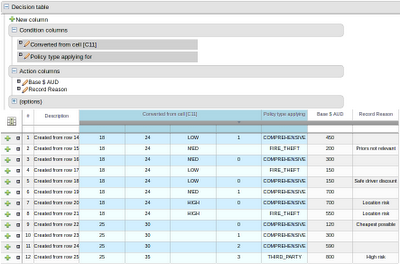 But starting from 5.4.0.CR1, such use cases are easy and far less code to implement. And they are compatible with real-time planning. Coming soon: a vehicle routing example and even better scalability.